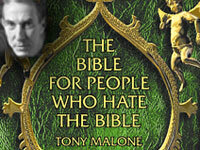 Tony Malone, author of The Bible For People Who Hate The Bible, on the Israel/Palestinian conflict talks about the origins of this conflict in regards to the Bible and Zionism. He addresses the Biblical precedents for the behaviors of modern Israel and we discuss possible outcomes of the Middle Eastern conflict in relation to Biblical "prophecy". Was the Biblical patriarch Abraham a Jew (in any sense of the word) and is there an "End Times"? Are believers within modern governments trying to manipulate events to fulfill Biblical predictions?